The 2008 Ford F-350 Super Duty has had a bit of a rocky time since it started shipping from the Kentucky plant in February 2007. Ford has recalled all the Super Duty trucks with diesel engines: a problem with the temperature control software presents a danger of tailpipe fires. Fortunately, it's a quick fix. Only the diesel models are affected; both the V-8 Triton and V-10 gasoline engines are fine. This isn't the first setback for the 2008 F350 Super Duty: the launch of the redesigned high-performance truck was originally scheduled for the 2007 model year, but a conflict with diesel vendor International Truck delayed it. The redesign has drawn breathless praise from reviewers and Ford truck fans alike. A heavier, sturdier frame is incorporated in a paradoxically elegant design, and the '08 Ford F-350 Super Duty gives an impression of performance as well as power. The engineering of the interior and suspension are also state-of the art, using some innovative high-tech materials like composite Quiet Steel. The '08 Ford F350 Super Duty is available in three trims: XL, XLT, and Lariat. 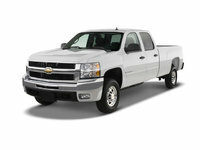 Regular Cab, Crew Cab, and Super Cab extended cab versions are available for each trim, along with a choice of long bed and short bed configurations. On the higher-end trims, you'll find a wealth of luxury touches that may remind you more of a fancy SUV than a powerful workhorse truck: leather seats with power adjust options, burl-wood dashboard accents, audiophile stereo, and the like. What's your take on the 2008 Ford F-350 Super Duty? 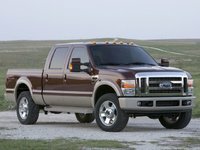 Users ranked 2008 Ford F-350 Super Duty against other cars which they drove/owned. Each ranking was based on 9 categories. Here is the summary of top rankings. Have you driven a 2008 Ford F-350 Super Duty?